By West Coast Jim from San Jose, Ca. WARNING... these shoe covers run very small compared to the sizes it states. Order at least 1 size up to make sure it willl fit. Protects soles from moisture.Recommend buying larger than recomended size. The material is stiff and plastic like which have already torn apart at the elastic stitching after just 1 month of use. I only needed one for my left foot so I have a back up but they are a terrible quality product. They are also hard to put on and remove even after buying the largest size cover for my size 12 men's shoes. I would look elsewhere as there are plenty of better options for shoe covers. 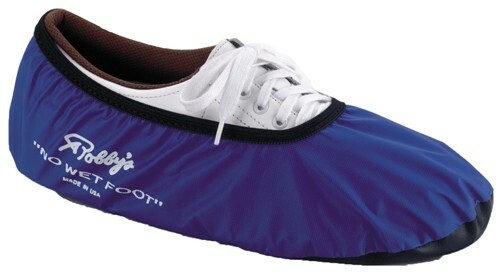 Due to the time it takes to produce the Robbys No Wet Foot Blue ball it will ship in immediately. We cannot ship this ball outside the United States.